You might want to add some internal notes (e.g. record check number) or apply tax. The check has bounced and you want to cancel the payment. Find the payment within the list and click on it. From the payment details, click the Edit button. Adjust the payment details as required. To assign the payment to another contact, click the Change button beside the name of the contact it's currently assigned to. Click the Save button. 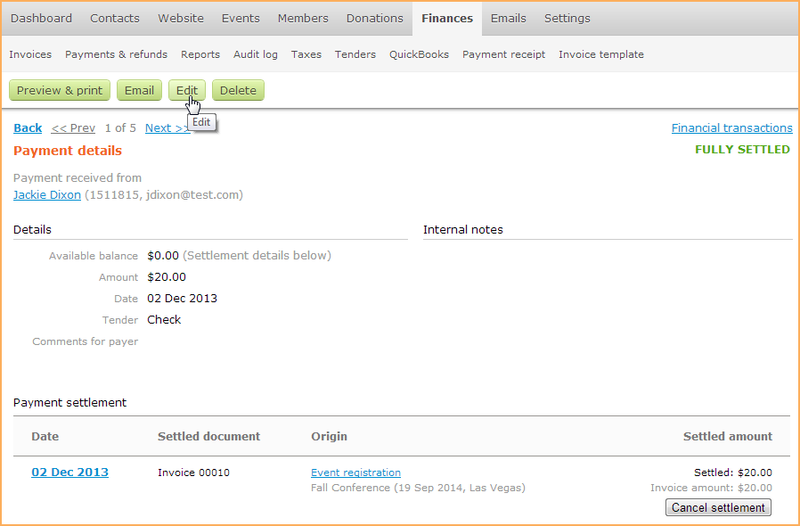 Payment details and contact records, including balance, are automatically updated. When you attempt to adjust the amount of a partially or fully settled payment to less than the settled amount, you will be warned that saving your change will result in the settlement being automatically canceled. If you proceed with the change, you'll need to manually settle the payment. You can cancel a payment by deleting it. Any settlements associated with the payment will be automatically canceled. From the payment details, click the Delete button.